November seems to be the month for bringing old favorites back to life. 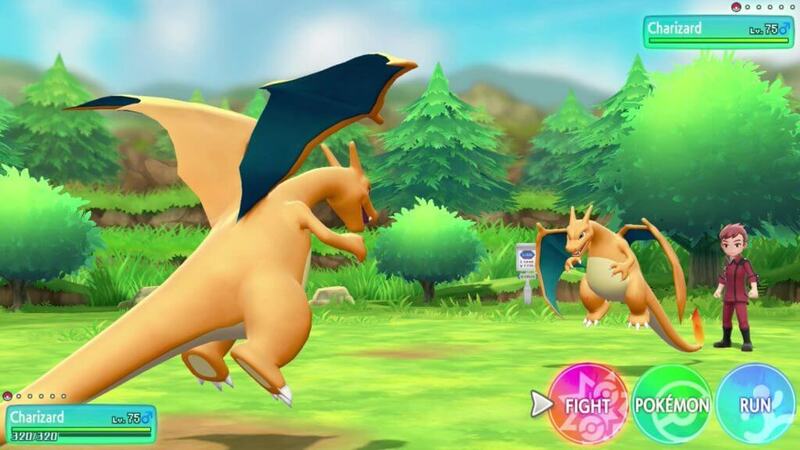 After playing the Spyro Reignited Trilogy, I was able to spend some time with Pokemon Let’s Go, and I’m still not entirely sure it succeeded, at least not in the way Reignited did. Pokemon Let’s Go isn’t so much a Pokemon Yellow remake as it is a reimagining. It takes place in the same region, with the same gym leaders, Elite Four, and Team Rocket, but it seems to be some time in the future. There are a lot of ways this game feels familiar to me, and a lot of ways it seems very alien; I’ll explain as we get into it. The game-play is really what sets Pokemon Let’s Go apart from other main Pokemon titles, and I’m having a tough time deciding how I feel about that. For starters, Pokemon in this version appear in the over-world, as opposed to being hidden until you walk into them and initiate a battle; I both like and dislike this new way of doing things. I love that you can see the Pokemon walking around because this is what it would be like if we lived in a world where the pocket monsters actually existed, but I dislike that you can choose to avoid them. You can decide whether or not you want to initiate contact with a Pokemon in the wild by simply walking around them, and this takes away a large portion of difficulty from the game. On the other hand, you can now travel from place to place much more quickly without being halted every thirty seconds by random Pokemon encounters, and I can understand the draw there. This ends up an even split between positive and negative for me, I love that we get to see wild Pokemon roaming, and I don’t absolutely hate that you can avoid them. Now, there is an aspect to Pokemon encounters that I do hate, and that is the lack of actual battle. When you walk up to the monster you have picked to be your new friend, you do not beat them into submission, you just feed them a few berries and throw a Pokeball until it sticks (taken straight out of Pokemon Go). Even though there is no actual battle going on, all of the Pokemon in your party still gain experience, which is baffling to me. EXP share is nothing new to the series, but the fact that they aren’t really doing anything to gain that experience is frustrating to me. “Yay, Eevee! You existed! Here, take a level!” Again, while I have this complaint, I can see the reverse argument as well. If this were to be a realistic situation, would you have more luck convincing a wild animal to be your friend by feeding it and being kind to it, or smacking it around until it faints? I think the answer is pretty obvious there. So, I won’t consider this a complete wash, but I’ll always prefer the old-fashioned way of beat and catch. A nifty little thing they added, is the ability for your companion Pokemon to find hidden items. Either Pikachu or Eevee, depending on which version you purchased (Eevee for me) will wiggle their tail to indicate that you are near a hidden item, and will even run over and grab it for you. I can’t really think of anything negative about that addition, I think it’s adorable. Another significant change I want to point out that I like is the ability to carry all of the Pokemon you catch with you at all times. 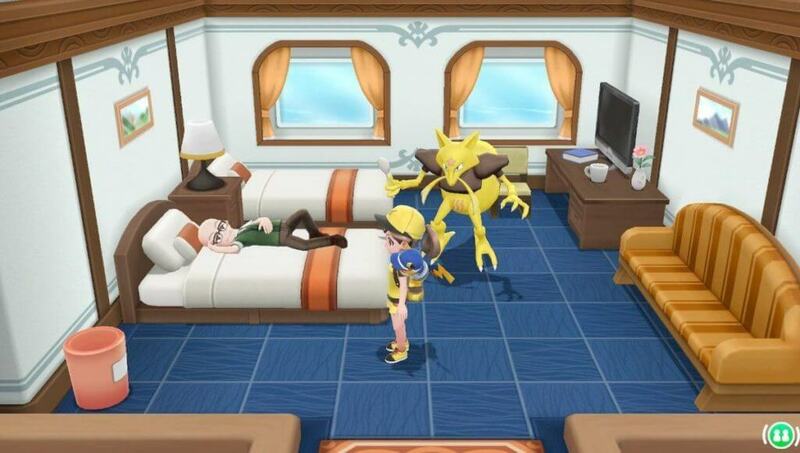 Instead of being transported to the PC after being caught, your Pokemon get stored on your person, exactly like in Pokemon Go, and you can change your party around at any time. Now, this does take another element of difficulty away from the game, but it’s one I’m okay with, only because it gets frustrating going back and forth to the Pokemon Center every time I want to try a new team combination. Aside from these changes (and a few others, but if I went into all of them we’d be here all day) the game plays very similarly to the original Pokemon Yellow title. You still need to beat gym leaders, you still need to travel around and complete various tasks and explore new areas to acquire the Pokemon you want, and you still get to tangle with the Elite Four. These things keep this game in my good graces and make up for a few of the changes I found disappointing. When it comes to length, it takes around five hours less to complete the story of Pokemon Let’s Go than it did to finish Pokemon Yellow. Personally, I don’t think this is because of anything lacking on Let’s Go’s side, some of the changes they made just make certain aspects of the game take less time, such as travel and Pokemon catching. The story is similar to that of the original and takes place in the same region with the same baddies, but personally, the story was never the point of Pokemon, it was always the exploration, quests, and gathering of monsters. We’ve touched on a few aspects of the difficulty, and I really do feel like this game was made for the next generation of Pokemon lovers, as it’s much more simplistic than the other main titles. For someone who is a Pokemon veteran and has played many of the old games, you might be a bit disappointed with this more easy-going take, but for anyone looking to get their young kids into Pokemon, this is an absolutely perfect first title. The graphics of Pokemon Let’s Go are, frankly, adorable. I love the upgrading of familiar animations and battle sequences. I love how bright and cheerful the world looks, down to how the grass interacts with your character. Everything seems smooth and a little bouncy, which matches the world perfectly. With all of the vibrant colors and original Pokemon animations, you can’t help but be in just a little bit of a better mood while playing. The same goes for the sound design. All of the familiar themes and sound effects are there, just upgraded. There are a few slight differences, but nothing so extreme that you don’t instantly get the old feeling of walking into a Pokemon Center with its unique song. Everything has been meticulously upgraded to the newgen standards, while keeping the feel of the original. It’s this sort of authenticity that keeps me in nostalgia mode while playing. At the end of the day, Pokemon Let’s Go isn’t exactly what I was wanting when it came to my very first main title console game, but maybe that isn’t a bad thing. This seems very much like the next generation’s Pokemon, and I’m looking at it from an old folk’s perspective. I can appreciate most of the changes they’ve made, even while I would have preferred them to stay the same. While I would have rather kept all of the original difficulty and hurdles that I’m used to from handheld Pokemon games, I can see introducing my younger nieces and nephews to the world of pocket monsters with this title, and I think that’s important. There is nothing integrally wrong with this game just because it isn’t my preference. It’s still a fun experience, and all of the core components that make it Pokemon are there. In reality, if you’ve played most of the core titles and are looking for a console version, this isn’t really the game for you. But if you want a way to introduce Pokemon to the younger generation so they can develop the same love for the series that you have, this is an excellent title. Pokemon Let's Go is a good first game for anyone on the younger side who is new to Pokemon, and a little taste of nostalgia for anyone who grew up with the franchise. The game-play is a little more simplistic, but the bones are there; it's a solid addition to the series.